Ikea and the Splasher have something in common: Neither one likes street art very much. Whereas one wanders the streets and splatters street art with aqua, purple and white paint, the big Swedish multinational dispatches its workers with rollers and blue paint. The supremely ugly and monstrously long blue construction fence Ikea has put up on Beard Street in Red Hook has been adorned with street art from time to time, which at least relieves the ugly, deadening sameness that has ruled since Ikea dispatched the Todd Shipyard buildings. Until this week. 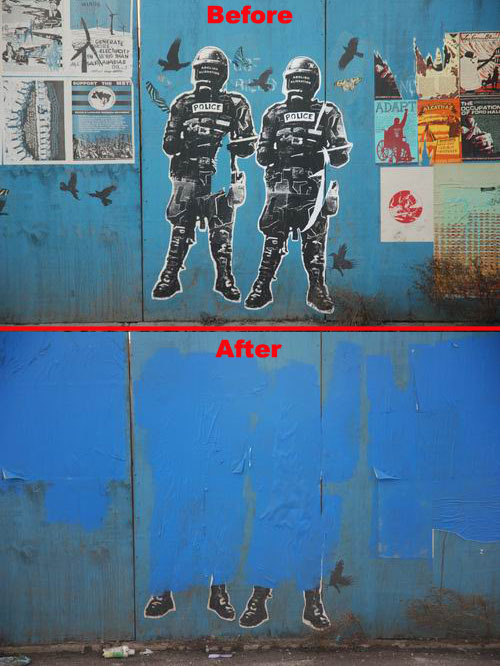 Perhaps inspired by coverage of the paint vandal destroying street art all over New York City, the Ektorp People decided that they could no longer allow the street art adorning their construction fencing to continue. (The latest batch had been there for close to two months.) There was some great work by visualresistance, peripherpheralmediaproject, swoon and others. That's the "before and after" shot above. i drove past the site this past weekend and saw that the building has begun to rise. 1 1/2 floors of steel framing can now be seen. ouch. New York as a creative capital is so over. speaking of the steel framing, walked my dog past it--is it just me or is it really crooked in spots? Yes, the steel does seem crooked from various angles then again everything about the whole project IS crooked from EVERY angle; the manipulation of the people in the neighborhood in order to garner the initial support, the awful Sara Gonzalez blindly giving it her blessing BEFORE the environmental impact statement was readied to ICKYAH's recent claim that hundreds of thousands of pounds of rubble were "stolen" on New Years Day. . .
it's funny, they think they will stop the creative spirit...it just proves that art is temporary but powerful. After all, we are talking about it once it's gone... honestly, though, they are a bunch of CHUMPS. Relentlessly covering (and in doing so encouraging) the actions of a vandal you apparently dislike is one thing, but linking his actions to a completely separate and unrelated case is just rediculous. Why not publish outright encouragement? Maybe we should all use rollers of blue paint and paint everything blue., the sky, the clouds, the streets and the ickier sign and the ikea doorways and the ikea customers. i like small shops with people in them. Thrift Store Shortage In Sunset Park & Brooklyn?